Our wide range of door styles come principally from Burbidge, PWS, Second Nature , Sinks & Things, ao.com, and Imperial Granite Kitchen Worktops among others. Their full ranges can be seen on their respective sites (click on the name). 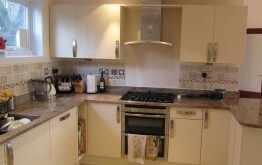 Our kitchen cabinets are delivered made up “rigid” and at times flat pack. We can and do supply almost any range of appliances at very competitive prices, or you can supply your own. 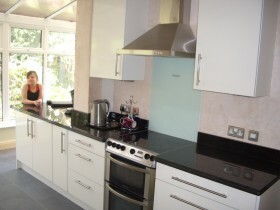 Our very competent fitters do the complete fit, including tiling and flooring. We also undertake minor internal building changes. 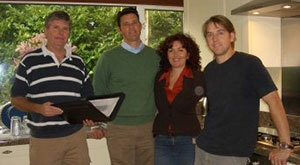 • Personal service, with projects managed by the owner, who designs the kitchen. • Computer-assisted design, working with your ideas and needs. • Regular visits to the site during fitting. • Years of practical experience means there isn’t a lot we haven’t seen or been unable to solve. • All on-site problems sorted out promptly, professionally and cheerfully. • Little problems and extras are taken care of. • Removal of rubbish and debris on completion.